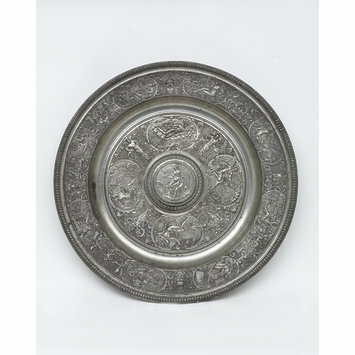 The 'Temperantia' Basin is one of the highlights of the V&A's pewter collection. It is a fine example of Edelzinn, literally ‘precious pewter’, which was produced in France and Germany during the late sixteenth and early seventeenth centuries. The dish was probably made to decorate the buffet of a prince or of a civic body such as a town guild. Contemporary illustrations show these buffets could be enormous, multi-tiered structures supporting rich displays of gold, silver, mounted exotic shells and colourful stones, and other items from their owners' treasuries. By the late 16th century, most fashionable patrons favoured fantastical Mannerist pieces for their displays. Mannerism was a courtly style based around the idea of difficultà: complex design, virtuoso craftsmanship and decoration infused with intellectual references. The surface of this dish is decorated with cast designs in relief with its central plaque depicting a figure of Temperance holding a wine-cup and ewer. Around the central boss a broad band of ornament contains four plaques with figures representing AER (air), AQUA (water), TERRA (earth), and IGNIS (fire). On the rim there are oval panels depicting the Seven Liberal Arts and their patron Minerva: GRAMMATIC (Grammar), DIALECTICA, RHETORICA (rhetoric), MUSICA (music), ARITHMETIQUA (Arithmetic), GEOMETRIA (Geometry) and ASTROLOGIA (Astrology). Between the plaques the dish is covered with finely cast strapwork, birds, masks, serpents, fruit, flowers and winged horses. As Edelzinn was designed for display it tends to survive in excellent condition. The dish is signed ‘FB’ on the central boss for Francois Briot, the most celebrated member of a French family of medallists and die-cutters. Briot was a model carver, medallist and pattern-maker rather than a pewterer, creating copper moulds in which pewter was cast. The Temperantia dish, is his only known signed work. It would have been extremely costly to produce. The intricate modelling was highly skilled work. Briot's most likely patron was Friedrich I, Duke of Württemberg (1557-1608), Count of Montbéliard (1581-93). Briot moved to Montbeliard in 1579 and by 1585 was appointed seal-engraver to the count and is known to have made medals for Friedrich. Briot's 'Temperantia' and similar 'Mars' basins have had a widespread influence. The V&A owns an almost identical dish by the early 17th-century Nuremberg modeller, Caspar Enderlein (Mus. No. 5477-1859). The Enderlein versions were not cast from an original but were made from moulds cut as line-for-line copies of the Briot dish. The model was further disseminated by polychrome pottery versions in Palissyware, of which the V&A has an example (Mus. No. C.2316-1910), and this in turn was copied in the 19th century (Mus. No. 1080-1871). Every year the winner of the women’s singles at the Wimbledon Tennis Championships holds a 19th-century Elkington and Company electrotype copy of Briot's very 'Mars' dish in The Louvre. 'Temperantia' dish, pewter, circular with a deeply sunk well and raised centre, its central boss with a plaque depicting a figure of Temperance holding a wine-cup and ewer. The central boss is signed in the mould: FB for Francis Briot. Around the central boss a broad band of ornament contains four plaques with figures representing AER (air), AQUA (water), TERRA (earth), and IGNIS (fire). The boss and the outer rim are surrounded by a cast band of ovals on a ground of fine diaper. Within this outer rim is a broad flat band divided into eight oval cartouches containing relief compositions of the Seven Liberal Arts and their patron Minerva: GRAMMATIC (Grammar), DIALECTICA, RHETORICA (rhetoric), MUSICA (music), ARITHMETIQUA (Arithmetic), GEOMETRIA (Geometry) and ASTROLOGIA (Astrology). Between the plaques the dish is covered with finely cast strapwork, birds, masks, serpents, fruit, flowers and winged horses. The reverse of the dish is plain but shows clear concentric rings where the dish was turned on a lathe after casting to remove excess pewter. Inside the hollow created by the central boss is a medallion depicting the modeller, Franci Briot with the inscription: SCVLPEBAT FRANSISCVS BRIOT. Cast into the dish: AER, AQUA, TERRA and IGNIS (inner rim); GRAMMATIC, DIALECTICA, RHETORICA, MUSICA, ARITHMETIQUA, GEOMETRIA and ASTROLOGIA (outer rim). Medallion on reverse: SCVLPEBAT FRANSISCVS BRIOT. This electrotype impression of a basin was one of the Museum's early purchases, bought by the Museum in 1855. Its provenance until the 19th century is not known. Electrotype copies were used as design aids for artists, artisans and students in the government schools of design which were run under the aegis of the Department of Science and Art. As an electrotype the basin is an example of a 19th-century design model. Electrotypes play a key role in helping us to understand the V&A in its earliest days. The Museum grew largely out of the Great Exhibition in 1851 and, under the guidance of Henry Cole, sought to arrest the perceived decline in British design. The Museum aimed, initially, to collect 'modern manufactures' for the education of manufacturers, designers and the public, with a long-term goal of improving the quality and quantity of Britain's manufactured goods. Cole was also in charge of the Government Schools of Design, which he set about reforming. Cole passionately believed in the potential of both museums and the schools of design, to raise standards of taste. The appointment of John Charles Robinson as curator of the Museum in 1853 heralded a slight change in focus. Under Robinson and Cole historic works of art were seen as just as instructive as contemporary work. For Cole and Robinson, if historic works of art could not be acquired, copies were a perfectly viable alternative. The aim of the Museum was to present a lesson in world ornament. The Museum bought electrotypes as part of its growing collection of reproductions. This collection enabled students to look closely at both modern and historic objects that were otherwise inaccessible. Electrotypes provided the same function as the Museum's collection of plaster casts. They sit alongside photography, invented around the same time, as the products of revolutionary new technology that enabled the reproduction of works of art to be made available to a wide audience. The relationship with photography is close. The electrotypes were not generally working copies. They were impressions of the outside surfaces of an object, in effect, 3-dimensional photographs. The dish was probably designed to decorate the buffet of a prince or of a civic body such as a town guild. Contemporary illustrations show that buffets could be enormous, multi-tiered structures supporting rich displays of gold, silver, mounted exotic shells and colourful stones, and other items from their treasuries. By the late 16th century, most fashionable patrons favoured fantastical Mannerist pieces for their displays. Mannerism was a courtly style based around the idea of difficultà: complex design, virtuoso craftsmanship and decoration infused with intellectual references. 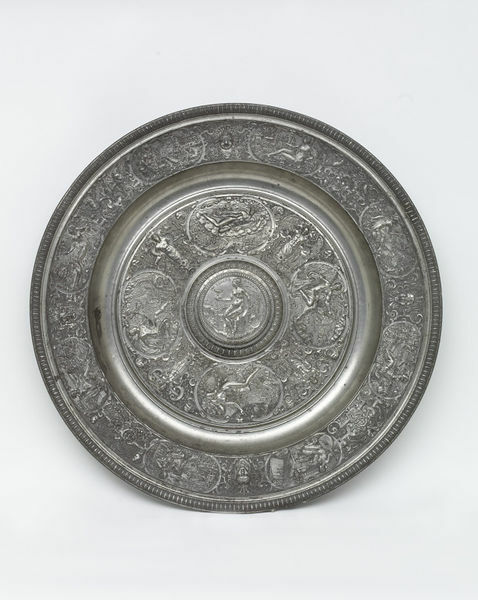 The surface of this dish is decorated with cast designs in relief with its central plaque depicting a figure of Temperance holding a wine-cup and ewer. Around the central boss a broad band of ornament contains four plaques with figures representing AER (air), AQUA (water), TERRA (earth), and IGNIS (fire). On the rim there are oval panels depicting the Seven Liberal Arts and their patron Minerva: GRAMMATIC (Grammar), DIALECTICA, RHETORICA (rhetoric), MUSICA (music), ARITHMETIQUA (Arithmetic), GEOMETRIA (Geometry) and ASTROLOGIA (Astrology). Between the plaques the dish is covered with finely cast strapwork, birds, masks, serpents, fruit, flowers and winged horses. The style was best suited to objects intended for display rather than for use. 'Temperantia' dish, France (Montbeliard), around 1585, pewter, cast in relief from a mould by François Briot (working 1550-1616). This is one of the original ‘Temperance Basins’ signed by Briot. It is a highlight of the V&A pewter collection. The basin is an example of Edelzinn (‘precious tin’), a highly ornamented type of pewter fashionable from the 1560s. Edelzinn was cast in intricately engraved iron and copper moulds, which were extremely expensive. Pewter makers depended on the demand for multiple copies to make investing in them worthwhile. This dish, signed by the celebrated pattern-maker Francois Briot, is one of the highlights of the V&A's metalwork collections. Briot was court engraver to John Frederick of Wurtemberg from 1585 and has been described as "the Raphael or Cellini of pewterers". The surface of the dish is decorated with cast designs in relief. The central plaque depicts a figure of Temperance holding a wine cup and ewer. Four plaques show figures representing Air, Water, Earth and Fire. The dish was probably designed to decorate the buffet of a prince or of a civic institution. The Museum bought the dish in 1855 for £19 from the collection of Ralph Bernal (d. 1854), a lawyer and MP. A version of this dish was subsequently copied (electrotyped) by Elkingtons of Birmingham to create the women's singles trophy at the Wimbledon Tennis Championships. François Briot designed the model and made the mould from which this dish was cast. The signature FB on the central boss of the dish was signed in the mould before casting. The pewterer who cast the dish is not known. The pewterer did not strike a 'touch mark' on the finished dish.